If you’ve considered laser skin resurfacing, dermabrasions or deep chemical peels, but hesitated because of the extended recovery time or anesthesia required, Pixel Perfect may be the right solution for you. 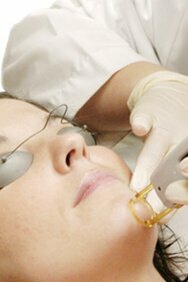 It provides similar dramatic results through a superior technology with fewer risks and a much faster healing time. Pixel Perfect™, the fractional rejuvenation procedure performed exclusively by Pixel ® laser technology from Alma Lasers®, lifts away years from your face and stimulates new collagen to grow. It improves your skin’s texture and tone to fight fine lines, wrinkles, and even acne scars. Pixel Perfect treatments are safe and effective, without injections or surgery. You may expect your skin to be flushed and red after the treatment-something like a sunburn. These symptoms are a normal part of the healing process and should improve quickly. Pixel Perfect works by creating thousands of microscopic perforations, but the skin around each of these perforations remains intact. This allows your skin’s top layer to heal from the edge of these tiny holes very rapidly, which significantly improves your complexion. In more detail, the Pixel ® laser light passes through patented optics to penetrate the skin with tiny thermal channels, only as deep as a few sheets of paper. In each channel it creates a micro-injury, without disturbing the surrounding tissue. Yes, Pixel Perfect may be performed on all skin types; however, it is a good idea to consult with your physician, as some skin conditions may interfere with proper treatment. How long may it take? Pixel skin rejuvenation treatments usually take less than 30 minutes, but could be longer if your condition is more advanced. Your exact treatment regimen may depend on your individual condition. Pixel Perfect treatments are safe and effective, without injections or surgery. You may expect your skin to be flushed and red after the treatment, but this is completely normal and short-lived. If you carefully follow your post-treatment instructions, this may be the limit of the difficulties you might experience.